Our trip to Utah was so amazeing this time. We took the family up to Pine Valley. Aunt Linda and Uncle Tony went, along with Bryce's cousin Jim and his family. Grandma and grandpa even went along for the ride. We saw the church that was built by Bryce's great great great great grandpa. It was so cool. The little town of Pine Valley was beautiful. I definatley want to go back. It is the kids' first day of school. Brody will be 13 years old in November and he is in the 7th grade. It is so amazeing how time goes by so fast. My beautiful Lou, this is her first year of middle school. She seemed pretty excited. She is 11 years old and she is so smart and has the best sense of humor of anyone I know. My girls remind me of myself in alot of ways but the one thing I pray for everyday is that they work hard and recieve a good edjucation. I want them to be better than me. I love my kids so much and I thank God for everyday that they are in my life. 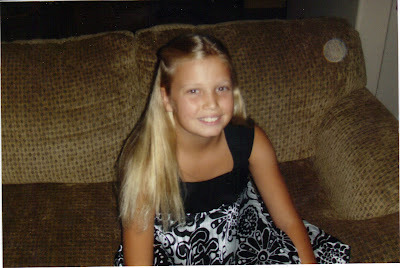 Lindy went to her very first dance. She was sooo excited. It was the fiifth grade sock hop. She put on her best sunday dress and her friend Justin picked her up and they danced their little hearts out for a couple hours. She moves on to Jr. High this year and it's all happening so fast. I couldn't ask for better kids. I am very blessed. We sure are proud of Brody. This year he went to Boy Scout Camp and earned five merrit badges. He worked real hard and I know it has given him a scense of accomplishment that he can feel good about. Now if I can only find something Lou was into. Well Hi there everyone sorry about the blog I had going before. I wasn't completly satisfied with it so I erased it and decided to try again. The kids are doing great. They are about to start school here in a couple of weeks. So far this year it has been alot of laying around for them. We went to Utah once to see Grandma and Grandpa Key that is always great. We love them. Grandma sure did seem to like baby Grace. She would reach for her every time she walked by. I'm hopeing we can get up there at least one more time before the kids go back to school. Pop looked good he sure does love Gram , he held her hand while they sat on the couch and watched t.v together. Aunt Linda, bless her heart she stayed with us all day. It was good to see all of our family and I look forward to going back as soon as possible.